In conjunction with Human Trafficking Awareness Month, Los Angeles County Sheriff’s Department Assistant Sheriff Maria Gutierrez recently announced details of the fifth annual Operation Reclaim and Rebuild operation, conducted by the Los Angeles Regional Human Trafficking Task Force and more than 90 federal state and local law enforcement agencies. The three-day, statewide human trafficking enforcement operation took place Jan. 24-29. It focused on rescuing victims of sexual slavery and human trafficking, providing services for victims, identifying and arresting suspects, and disrupting the demand for victims by targeting customers. Investigators addressed sidewalk prostitution and the human trafficking suspects operating on the internet. Specially trained cyber detectives posed as vulnerable teenagers and interacted with suspects on social media. Victims encountered during enforcement efforts were cared for by personnel from children and family services agencies and victim service providers. 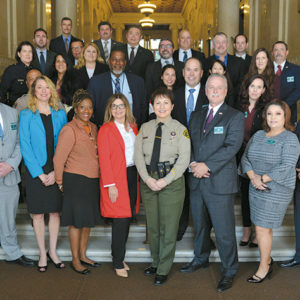 In Los Angeles County, the nonprofit Coalition to Abolish Slavery and Trafficking and Saving Innocence coordinated the emergency services response for victim care. Operation Reclaim and Rebuild resulted in 34 adult and 14 minor victims being recovered; 156 men arrested for the solicitation of prostitution; and 36 individuals arrested for human trafficking and exploitation. Gutierrez also had a message for people involved in human trafficking.